Dead Aim marks the always welcome return of Joe R. Lansdale's most enduring fictional creations: Hap Collins and Leonard Pine. The story begins simply enough when the two agree to provide protection for a woman harassed by her violent, soon-to-be-ex husband. But, when a protracted stakeout ends in a lethal shooting and a pair of moldering corpses turn up in an otherwise deserted trailer, the nature of this ""routine"" assignment changes dramatically. The ensuing investigation unearths a complex web of lies, duplicity, and hidden agendas that leads from an upscale Texas law firm to the world of organized crime, culminating in the kind of explosive, anything-can-happen confrontation that only Joe Lansdale could create. 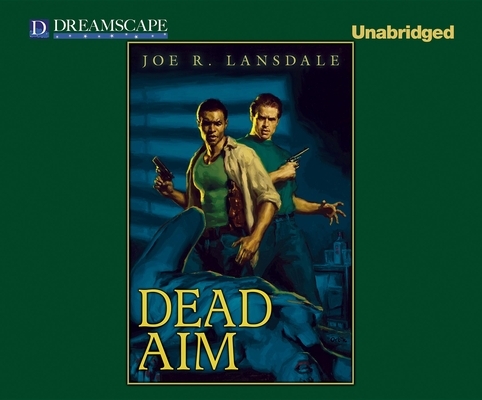 Joe R. Lansdale is the author of over thirty novels and numerous short stories. He has received the Edgar Award, eight Bram Stoker Awards, the Horror Writers Association Lifetime Achievement Award, and many, many others. His novella Bubba Hotep was adapted to film by Don Coscarelli, starring Bruce Campbell and Ossie Davis. He is Writer In Residence at Stephen F. Austin State University, and lives in Nacogdoches, Texas, with his wife, dog, and two cats. READER BIOPhil Gigante has narrated over 70 audiobooks, including Audie Award winner The Dark Highlander. An actor, director, and producer with over 20 years' experience in theatre, film, television, and radio, he is currently the artistic director of Gigantic Productions and Little Giant Children's Theatre. He makes his home in the Midwest.